Government is growing every day. 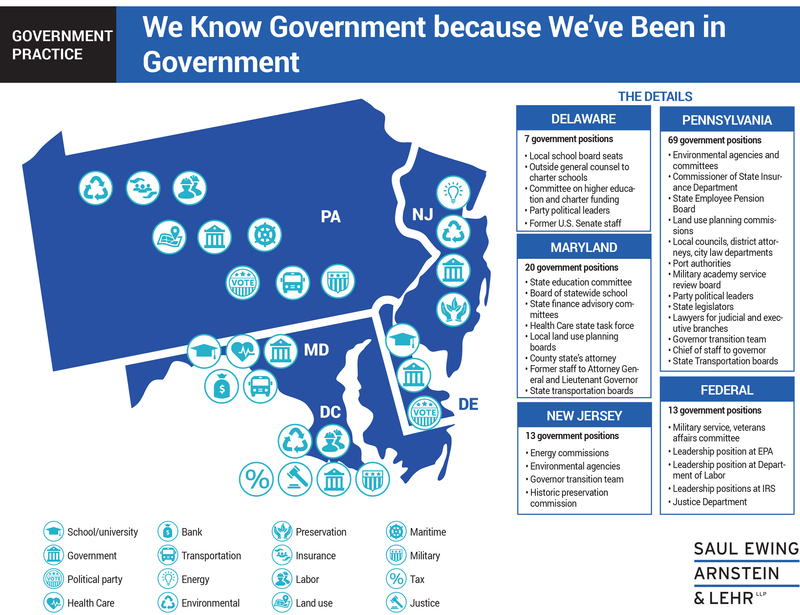 Regardless of which political party is in power, the scope of government regulation at the state, county and local levels, and the impact of government on all types of business has regularly increased. Regardless of your type of business -- manufacturing or finance, communications or service -- and regardless of your size, you will need skilled assistance to navigate your way through your governments’ cross currents of regulation. Saul Ewing Arnstein & Lehr attorneys understand government and the potential impact of its grinding power on your business's goals. We also understand that, to the extent possible, the overwhelming majority of our clients want to fully comprehend the regulatory structure applicable to their businesses so that they can achieve their goals while complying fully with the regulations. From time to time, though, some need to proceed otherwise and challenge a particularly burdensome law or regulation. 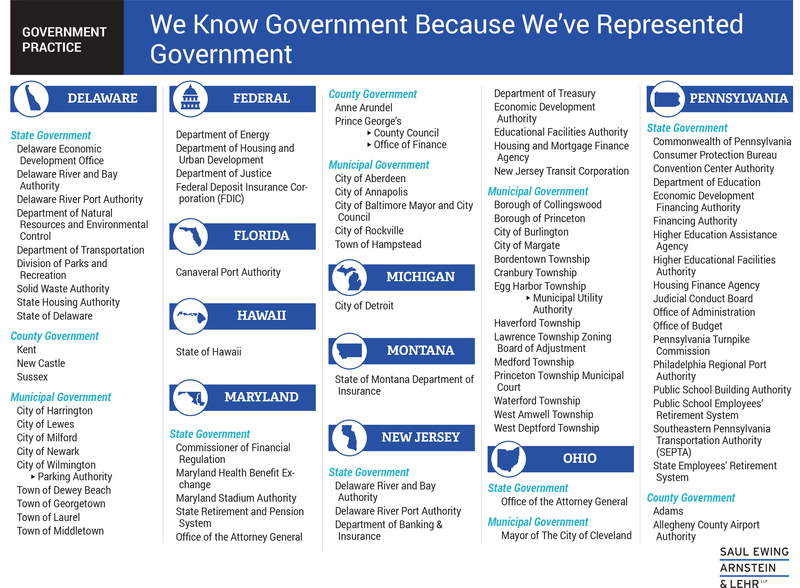 Our attorneys have a keen understanding of the federal, state and local laws affecting businesses from the relationships we have developed from representing clients before many county and local governments and state and federal agencies. 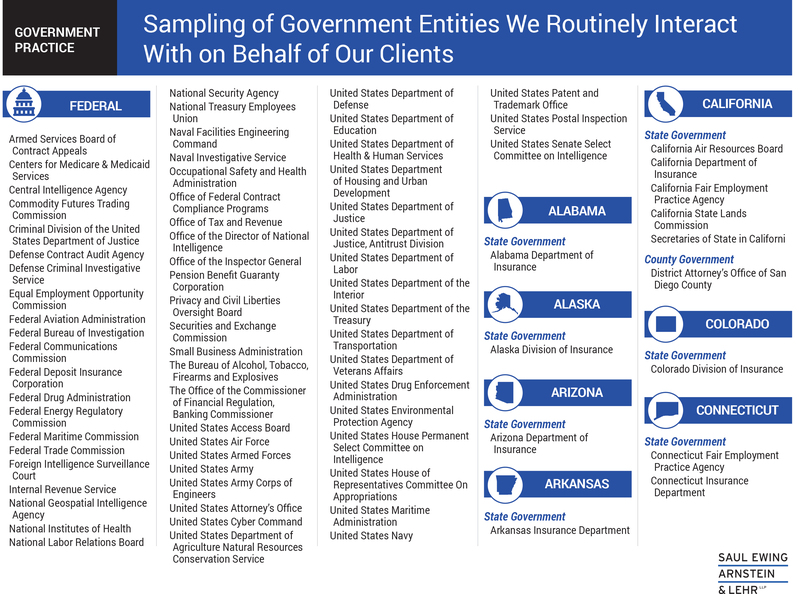 These connections help our attorneys to not only keep clients current on the evolution of regulations but to also provide the perspective they have gained from effectively navigating the government’s regulatory demands, securing government approvals and, as a last resort, defending you in litigation involving the government. Our firm also has strategic alliances with lobbying, government and non-legal consulting firms to help our attorneys track legislation and regulations so we can share these developments with you.